Author: Wilhelm J.G. Möhlig, Jekura Uaurika Kavari. Series edited by: Axel Fleisch, Wilhelm J.G. Möhlig. Herero, a South-Western Bantu language, is one of the main languages of Namibia spoken by about 8% of the population. Based on former census data the number of its speakers is estimated at 180,000. Otjiherero has a standardized orthography and is taught as a subject at schools and at the University of Namibia. Its comparatively modest literature consists of schoolbooks, short stories, poems and the bible. There is a modern dictionary comprising three languages: Otjiherero, Afrikaans and English (Viljoen & Kamupingene 1983). A comprehensive grammar for learners having Afrikaans as their meta language (Booysen 1982) is available as well as two grammatical sketches that were written by Ohly (1999) and Möhlig, Marten & Kavari (2002). 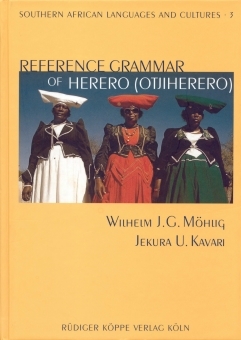 Otjiherero is one of the important national languages of Namibia and therefore deserves a modern systematic and comprehensive grammar in English as the meta language. This publication not only provides this comprehensive grammar, it also sheds some light on the long overlooked prosodic features of Otjiherero, such as tone, stress and accent marking and other supra-segmental features like intonation. Closing this first part of the book, the authors, by way of a historical phonology, retrace the route of migration of the Herero people across the African continent to an origin near Lake Malawi. The following chapters take a comprehensive look at the morphology of the language, while also putting it in a comparative perspective within the wider field of Bantu languages. An extensive description of Otjiherero syntax comprises the third and last part of the book. Basic sentences and short predications are explained, while special attention is given to compound sentences and questions. A discussion of focus and emphasis picks up, where a look at stress and accent marking in Otjiherero phonology left off. After the grammatical chapters, some linguistically analysed texts demonstrate the application of the abstract rules given before. As a service for the user of this grammar, comprehensive wordlists with tonal markings are added as well as an index of the linguistic terms used in this grammar. First and foremost one should note that the book under review needs to be treated as the leading book for the description of Bantu languages and that other authors, for Bantu languages at least, will get enlightened by this book. [...] the best reference grammar book produced. Matters presented are typical issues in Bantu languages and the handling of difficult issues like tone by Möhlig and Kavari makes the book the best. Linguists and Bantuists in particular are encouraged to follow the structuring of the contents as well as the description contained therein.